This is a high quality collection of Easy Pieces for Mandolin. If you play the mandolin, this is a must have book/cd collection. These medieval pieces sound great on the mandolin. They also lay right under the fingers. There is both notation and TAB and no page turns for any of the pieces in this book. The reason? This book is made for musicians, by musicians. The book comes with a CD and the guitar and mandolin are on separate tracks. You can turn the mandolin totally off and play with the cd. There are two measures of intro with the guitar, so you can sit and listen to the CD and become familiar with the sounds of the pieces without it sounding like a learning CD. There are chords with the music and at the end of the book, there are examples of what the guitar is doing for many of the tunes in both tablature and notation. These tunes sound terrific, and are a great addition to any repertoire. You can use them for any kind of gig, or you can try doing some medieval fairs, medieval feasts or medieval weddings. The bowl back mandolin looks so much like the lute, most people would never know the difference. 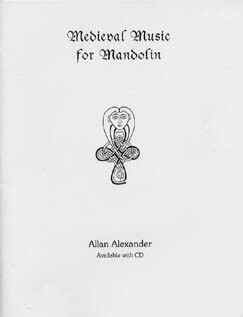 Allan the author plays the lute, guitar and more recently mandolin and has a wealth of knowledge about the music. These pieces are particulary suited for the sound of the mandolin. The book is beautiful and scored professionally. The titles may not make a lot of sense, but these are great pieces with many of them having variations to make them longer. We do not believe there is another book like this available.